A false alarm on your home alarm system because a code was incorrectly entered or a pet set off a motion detector isn't uncommon, but in some Indiana cities and towns it could end up costing you big. LAWRENCE — A false alarm on your home alarm system because a code was incorrectly entered or a pet set off a motion detector isn't uncommon, but in some Indiana cities and towns it could end up costing you big. 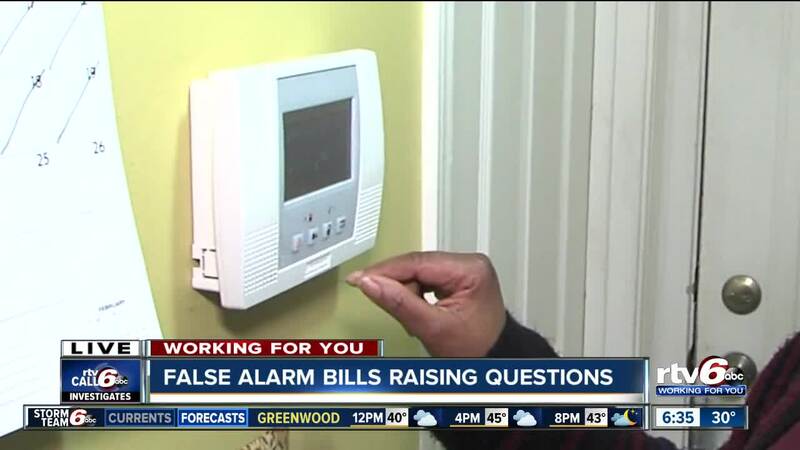 It's not an uncommon practice for cities to charge people for false alarms, in fact many cities around the state charge anywhere from $25 to $100 for each false alarm. But the false alarm bills being sent to families in the City of Lawrence are causing some confusion. Elizabeth Howard reached out to Call 6 Investigates after she got a bill for a false alarm that didn't quite look right. The bill came from the City of Lawrence, IN False Alarm Reduction Program, but the address is a P.O. Box in Detroit, Mich. and directs the resident to pay the fine at an online website. None of the phone numbers, email addresses or website addresses on the bill are connected to the City of Lawrence. She tells us her son did accidentally set off the alarm back in 2018, police did respond and check things out. Howard thought that was the end of it. "What was it like when I opened the mail I initially thought this looks sketchy, it looks like it's not authentic," Howard said. "I discussed it with my husband and he does this doesn't make any sense." Thinking it was a scam, she didn't pay the bill. But then another bill showed up and then a collections notice. She started calling the city and found out it was a legitimate bill as part of a city ordinance that allows the city to charge $25 for false alarms. The bills are sent from Cry Wolf Services, who is under contract with the City of Lawrence to send these alarms. But the bills Howard received didn't even say they were from Cry Wolf Services or even describe that ordinance or any part of the why the City of Lawrence has the program. We took the bills to Captain Tracey Cantrell at the Lawrence Police Department, who oversees the program. He tells us the program was first put in place back a few years ago to reduce the number of false alarms across the city at residents and businesses. "It's one of those things that it's always a recurring [issue]," Cantrell said. "You're never going to get away from false alarms." Responding to false alarms is a major time waster for police. Each alarm takes two to three officers off the street to respond to the call and check the home or business. The city has previously put out information about the alarm fines and their contracted company on city social media, the city's website and information was placed inside resident's water bills, but the department agrees that some people may have missed it. When we showed Captain Tracey Cantrell the bills, he agreed that it isn't the most clear. Cantrell said after Call 6 came them with the concerns, the police department is planning to work with Cry Wolf Services to create better billing for residents that may get the bill in the future.